Though Theory of Constraints was originally offered by Eliyahu Goldratt as a manufacturing scheduling method, over the course of his career, Goldratt evolved TOC into a systems methodology which encompasses a wide range of concepts, principles, solutions, tools and approaches that strive to ensure any change undertaken as a part of the ongoing improvement will benefit the system as a whole (Dettmer W., 2006). Consistent with the systems philosophy and unlike the classical or behavioral management theories, TOC views organizations as a chain of many links or networks of chains. Conventional thinking tends to address large systems and its problems by breaking them up into smaller, simpler units, i.e. through the process of “analysis”. This approach is concerned primarily with linear relationships and mostly ignores the possibility of dynamic change and multiple feedback loops. To the contrary, the systems approach is concerned “synthesis”, i.e. the view that various elements of systems are interconnected. In a system, all these interconnected and interdependent parts contribute to the overall goal of the entire system. More importantly, this view recognizes that the system may fail even if a functional division within is successful. Further, TOC emphasizes nonlinear cause and effect with feedback loops since it is possible that actions taken in one part of the organization can have unintended consequence on another. From this perspective Goldratt’s TOC bears resemblance to the work of other systems theorists like Peter Senge, Jay Forrester etc. who proposed undertaking problem solving while viewing them as part of the overall system rather than in isolation. 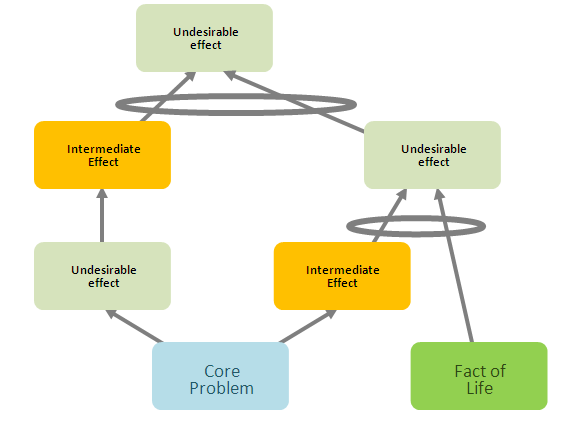 Modelling the system world view is complex because as Peter Senge puts it “A system can present dynamic complexity when cause and effect are subtle”. Obvious interventions can produce non-obvious consequences. Though apparently complex, Goldratt identified that these systems are driven by simple rules and the root causes for problems faced by organizations can be identified through convergent thinking. Unlike divergent thinking (where many ideas are generated and evaluated), convergent thinking synthesizes the information available and attempts to drill down to the core issue. For this, Goldratt has developed a set of tools to methodically structure and solve fundamental conflicts in organizations and enable a process of ongoing improvement. Being a trained physicist, for conceptualizing and designing these “thinking process”, he has borrowed heavily from the hard sciences. This is not surprising since systems theory itself has its origin in the sciences and the belief in the interdependence of all things is fundamental to the natural laws. This bedrock of hard sciences is clearly discernible in Goldratt’s work since traditions and methodologies of the hard sciences as established by philosophers of science like Karl Popper, Max Born etc. have distinct characteristics (Mohanty, Vector Consulting Group, 2013). In theory, these traditions are considered scientific only if it is falsifiable (Popper, 2002). Support for theories can be had if they cannot be falsified by observation and experiment; there is general consistency with which a wide body of data can be explained; and if these theories correctly predict new discoveries or properties. Interplay between tentative theories (conjuncture) and error elimination (refutation through attempted falsification) advances scientific knowledge. These characteristics are generally missing in social science theories which (while they may be valid) are crafted in such a way as to “make it impossible for criticism or experiment”. Unlike the deductive reasoning of the hard sciences, inductive reasoning is more common in social sciences; theories tend to be based on qualitative tools and causal relationships are difficult to establish and validate. More subjective, the social science methods are often criticized of poor generalisability. Contrary to the general practice of such social scientists, and by adopting the traditions of the hard sciences, Goldratt established tools for TOC which help raise questions regarding accepted practice, existing paradigms and perspectives that are constraints in the path of ongoing improvement. This rigor of the hard sciences is most evident in the logical constructs of these tools or diagrams. The Thinking tools based on these constructs help identify the core conflict or constraints, construct a complete solution and devise plans for implementing this solution by exploring and communicating information and assumptions about the current reality, future reality and how to get there (Cox & Spencer, 1998). The “TOC Thinking Processes” as they were called, were introduced by Dr. Goldratt in a business novel, It’s Not Luck (Goldratt, Its not Luck, 1994) and when used enable the process of ongoing improvement in any organization. To what to change to? How to cause the change? The tools of the thinking process can guide decision makers in answering these questions by facilitating the process of problem structuring, problem identification, solution building, identification of barriers to be overcome and implementation of the solution. The logical constructs of these tools or diagrams are the necessary condition logic, the sufficient cause logic and the strict logic rules that are used to validate cause-effect relationships which are modelled with these tools. 1.3.1. Sufficiency thinking: The TOC thinking process is built up by constructing connections between observed effects and causes. To do so the basic constructs used are the examination of Causality and Necessity. Sufficiency thinking examines these patterns of effect-cause-effect. 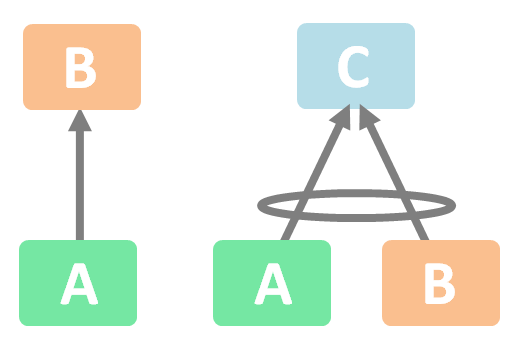 There can be three types of sufficiency: A is sufficient to cause B; A and B separately cause C or A and B together cause C. the wording used is “If…..then” to express these cause effect relationships. These patterns can be used to visualize the cause-effect relationship and uncover the assumptions and reservations to any of the components in order to facilitate thinking, problem solving and communication with other people. 1.3.2. Necessity thinking: Necessary thinking is the thought pattern used when attempt is being made to establish the conditions that need to exist to accomplish something else. Necessary conditions are rules, policies or laws that provide limitations or boundaries to the cause and effect. This thinking uses the wording “In order to achieve A we must have B”. Figure 2 illustrates this necessary condition thinking. Sufficiency and Necessary condition thinking can be used to surface and challenge assumptions with the help of the eight rules of logic in order to aid in the decision making process. Using the constructs for thinking and the eight rules of logic, the six TOC Thinking Process tools allow decision making to be undertaken in the Socratic tradition of questioning the cause and effects relationships and the validity of the underlying assumptions. This comprehensive set of logical tools can be used for analysis, solution development and solution implementation for individuals, groups or organizations. Each tool has a purpose and nearly all tools can be used independently. Figure 3 is the summary of these tools. To assist in relationship between subordinates and bosses. Identify the core problem that eventually produces 70% or more of the system’s UDEs. Identify the one simplest change to make that will have the greatest positive impact on the system. Using the rules of logic anyone can question the logic presented. Any conflict unearthed by the CRT can be examined with the help of the evaporating cloud. 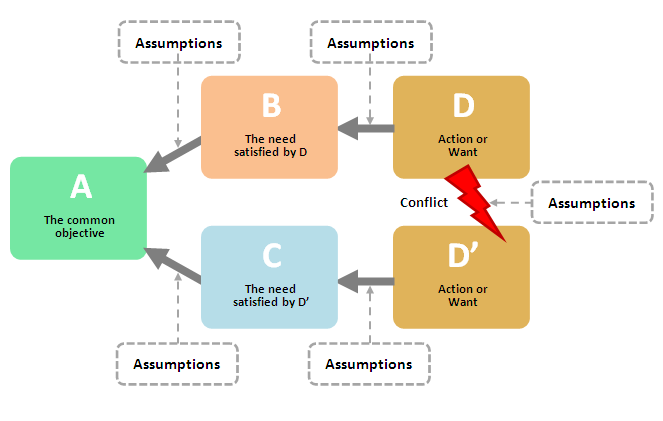 The conflict resolution diagram or the evaporating cloud helps build new insights into the core problem or conflict facing an organization, individual or group. The cloud deals with all kinds of problems that involve a dilemma or a conflict between two mutually exclusive actions or wants. Using five interconnected boxes the cloud guides the user to understand that each of the two conflicting actions is to achieve some need. These needs are required to meet an objective. This allows the user to have a structured framework to analyze the problem (Fedurko, 2013). The cloud structure is the raw material for finding the assumptions -the reasons why these relationships are thought to hold, and articulating them. 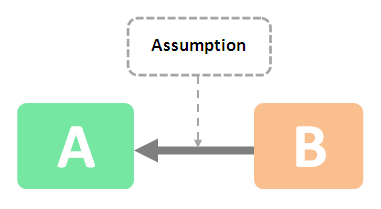 These assumptions are represented as thought bubbles on the diagram. Invalidating the weak assumptions can evaporate the cloud. Or “injections” can used to “attack” valid assumptions allowing for resolution of the conflict. Dilemma Cloud: Used for situations when a person has two clear courses of behavior and cannot decide which one to take. Organizational interest conflict cloud: for conflicts of interest between two different functions of an organization. UDE cloud: for situations when a system has been suffering from certain recurring problems that do not allow it to gain the desired performance. Once the injections i.e. actions, conditions and solutions needed to resolve conflicts are identified, the FRT can be constructed linking these to desirable outcomes. The logic of these linkages is checked through the sufficiency based logic. It helps clarify what actions and conditions will be necessary and sufficient to bring about desirable effects or change. Thus this logic-based tool is useful for constructing and testing potential solutions before implementation (Kendall, 1998). Serves as an initial planning tool. 1. Gather all of the needed information and materials. 2. Articulate the desired effects. 3. Start with the injection(s) at the bottom. 5. Add additional injections wherever necessary. 6. Build supporting loops if possible. 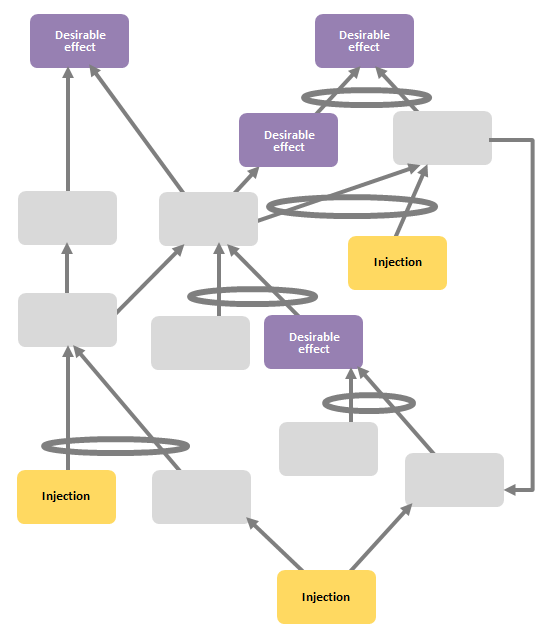 FRT may have subtrees constructed to explore negative side effects of proposed solutions. These are called the negative branch reservation. NBR is a logic- based tool using cause-and-effect relationships which formally a sub tree of the FRT but can be used as a stand-alone tool to improve feedback and develop ideas (Dettmer H. , 1998). For each of the injections on the FRT, a PRT will answer the question: what currently prohibits its implementation? Therefore, PRT complements the FRT and helps identify obstacles that might block the path of the desired outcomes and then set new actions that can help in overcoming these obstacles. To identify obstacles that prevent achievement of a desired course of action, objective, or injection). To identify the remedies or conditions necessary to overcome or otherwise neutralize obstacles to a desired course of action, objective or injection. To identify the required sequence of actions needed to realize a desired course of action. To identify and depict unknown steps to a desired end when one does not know precisely how to achieve them. The TRT identifies tasks and actions both necessary and sufficient to meet the intermediate objectives of the PRT. The focus is not on the plan to do but on the plan to accomplish. For each intermediate objective (IO), a specific action or set of actions are determined and initiated. Causing a specific change in reality is the imperative. Thus, the transition tree provides a road map for getting for reaching the goal. 4. an expected effect of the integration of the preceding three. 5. the rationale for a need at the next higher level of the tree. Each succeeding level of the Tree is built upon the previous level, with the expected effect taking the place of the unfulfilled need. These build progressively upward to an overall objective or desired effect. Prevent undesirable effects from ensuing as a consequence of implementation. Despite its origins as a manufacturing methodology, Goldratt’s Theory of Constraints (TOC) methodology is now regarded as a systems methodology with strong foundations in the hard sciences. 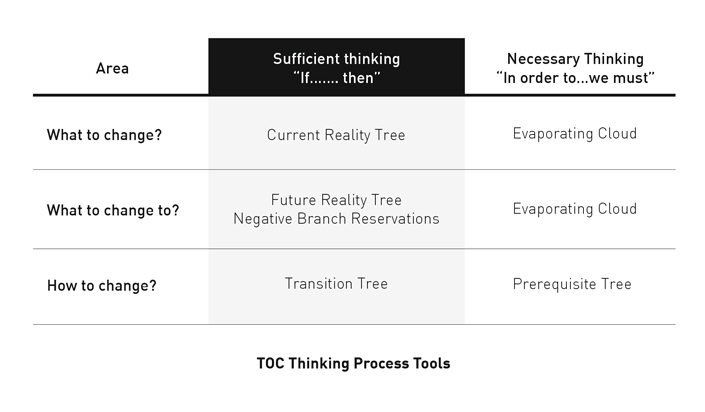 Through its tools for convergent thinking and synthesis, the “Thinking processes”, which underpin the entire TOC methodology, help identify and manage constraints and guide continuous improvement and change in organizations. This process of change requires the identification and acceptance of core issues; the goal and the means to the goal. Since the thinking tools are designed to address successive “layers of resistance” (refer to Appendix 2) and enable communication, it expedites securing “buy in” of groups. While CRT represents the undesirable effects of the current situation, the FRT, NBR help people plan and understand the possible results of their actions. The PRT and TRT are designed to build collective buy in and aid in the Implementation phase. Cox, J. I., & Spencer, M. (1998). The TOC handbook. Boca Raton,FL: St. Lucie press. Dettmer, H. (1997). Goldratt’s Theoy of Constraints:A Systems Approach to Continuous Improvement. Milwaukee,WI: ASQC Quality Press. Dettmer, W. (2006). The logical Thinking Process: A system approach to complex problem solving. Milwaukee, Wisconsin: ASQ Quality Press. Fedurko, J. (2013). Through Clouds to Solutions: Working with UDEs and UDE clouds. Estonia: Ou Vali Press. Goldratt, E. (1994). Its not Luck. Great Barrington,MA: North River Press Publishing Corportaion. Goldratt, E. (1997). Critical Chain. Great Barrington,MA: North River Press Publishing Corporation. Goldratt, E., & Cox, J. (1992). The Goal: A process of Ongoing Improvement. Great Barrington,MA: North Niver Press Publishing Corporation. Kendall, G. (1998). Securing the Future: Strategies for Exponential Growth using the Theory of Constraints. Boca Raton,FL: CRC Press. McMullen, T. (1998). Introduction to the Theory of Constraints (TOC) Management System. Boca Raton,FL: St.Lucie Press. Popper, K. (2002). The logic of scientific discovery. London and New York: Routledge. 7. Entry Point: any entity that does not have an arrow pointing to it. 8. Injections: Entry points that are entities that do not yet exist, and are used to indicate actions that need to be taken to cause a desired effect. Layer 3. Disagree that the solution solves the problem. Layer 4. Yes, But, there are potential Negative consequences. Layer 5. Yes. But, there are obstacles to implementing the solution. Its great learning .. I could have figured out how to proceed while applying TOC.. would like to learn more..